Katie Holley made a 2 a.m. emergency room visit after realizing that the pain in her ear that she described as “feeling like an ice chip” was actually a palmetto bug! Holley said cockroaches had been a problem ever since she and her husband bought a house in Florida last year. The couple had their house sprayed for the insects several months back and thought they were free of the infestation. But then one night in March Holley woke up in the middle of the night when she felt something strange in her ear. 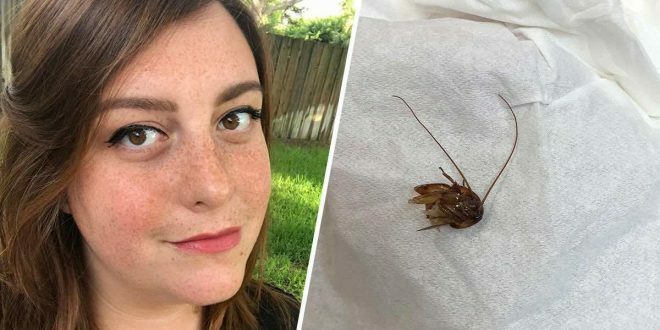 As she began to panic, Holley’s husband grabbed a pair of tweezers and tried to pull the roach out, but he only managed to pull out two of its legs. The two decided they needed to get her to a hospital to have the bug removed. Once they arrived at the emergency room, a doctor had Holley lie down with her left ear (with the roach) up so he could work on removing it. She went on to describe the strangest part, which was the still-alive roach reacting to the doctor putting the numbing agent Lidocaine in her ear. “Feeling a roach in the throes of death, lodged in a very sensitive part of your body, is unlike anything I can adequately explain,” she wrote. The numbing agent killed the roach after about two minutes. Once it was extracted, Holley said it was about the size of the top two portions of her pinkie finger. But the ordeal wasn’t quite over. About a week later she went back to the doctor’s office as her ear was still in pain. It turned out many pieces of the roach were still inside her ear canal, including the head.